What’s the first thing you reach for when you suffer from a sunburn? It’s likely a bottle of aloe vera (all-natural or not), and while no one can contest the effectiveness of aloe vera in soothing a sunburn, there’s a mess of other amazing natural ingredients that can help draw out the heat and ease the discomfort of a sunburn. 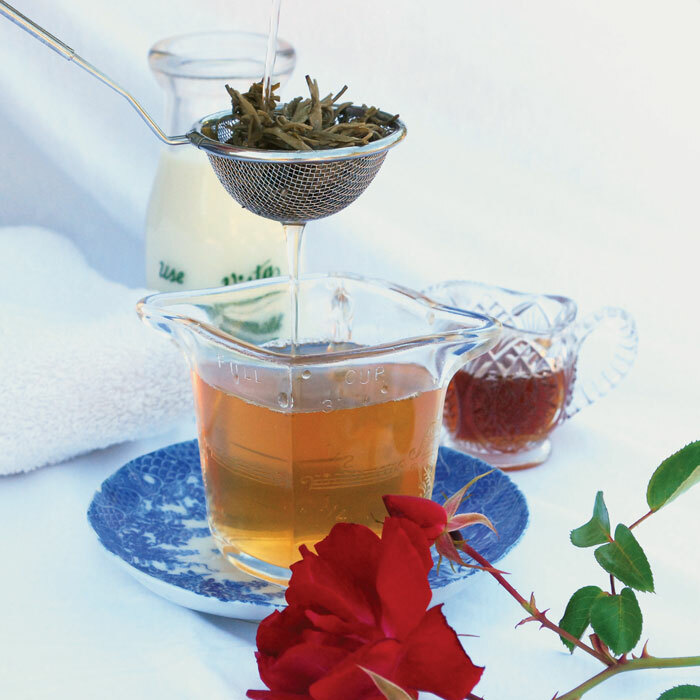 The second beauty DIY I’m excerpting from 100 Organic Skincare Recipes reminds us that various teas have the power to soothe and heal sunburns, too. And yeap, there’s aloe vera in this recipe, too. There is nothing like a cool mist of this Healing Sunburn Spray and Compress to soothe your tender overexposed skin. The green tea used in this recipe contains tannic acid, theobromine, and polyphenols — all of which are soothing and healing to sunburned skin. In addition, yerba mate is a South American super-antioxidant that helps speed tissue repair. With the addition of cooling peppermint and the skin healers chamomile and aloe vera, this concoction is sure to soothe the sting of a sunburn! Boil 4 cups of water in the saucepan. Remove from heat and add the herbs and tea, stirring with a spoon to moisten thoroughly. Let the infusion steep for 15–20 minutes. Strain the herbs from the brew and pour into the jar. Place in the fridge and cool completely, 15–20 minutes. Once the brew has cooled, add the aloe vera and essential oil. Seal the lid tightly and shake well to blend. Pour some of the mixture into a spray bottle. Reserve the remainder in the jar. Store in the refrigerator for up to 2 weeks. Shake before use. Spray affected areas as desired. Soak a soft cloth and apply as a compress for 10–15 minutes to affected areas. If you do not have access to fresh peppermint, chamomile, loose leaf yerba mate, or loose leaf green tea, substitute tea bags: 1 peppermint, 1 chamomile, 1 yerba mate, 1 green tea. Make sure the tea bags contain only the pure herb, without any flavorings or additional blended herbs.